Harrisville is an unincorporated city in Alcona County. Population: 529. 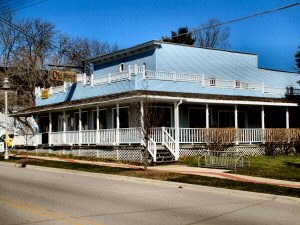 City Hall: 200 Fifth St., Harrisville, MI 48740, (989) 724-666. Harrisville is the county seat for Alcona County. 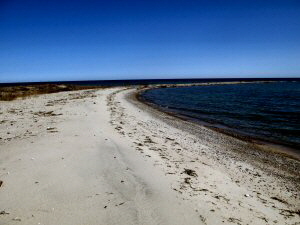 It is located on the shores of Lake Huron at the junction of M-73 and US-23. Harrisville’s main business today is tourism. 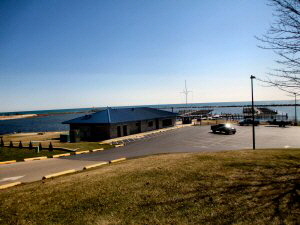 Several bed & breakfast inns and motels are located along the Lake Huron shoreline and Harrisville State Park is located just south of town. Harrisville’s beautiful harbor offers boating and fishing. Several charterboat SERVICES: Building, Dental, Personal, Professional, Medical, Real Estate, Rental, Repair, etc. : Building, Dental, Personal, Professional, Medical, Real Estate, Rental, Repair, etc.operate from this harbor. 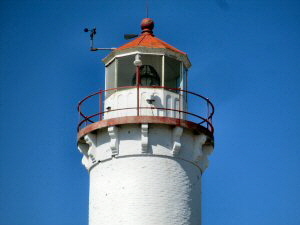 The Harrisville Harbor and Sturgeon Point Lighthouse located north of town are popular sightseeing locations. Harrisville State Park located on the south edge of town is a very popular destination for campers. In 1854, two fishermen, Simeon Holden and Crosier Davison, in partnership, first purchased pine lands and water power privilege here, and the place became known as Davison's Mill. They sold out to Benjamin Harris and his sons, Levi and Henry Harris, of West Bloomfield, N.Y. When the township was organized in 1860, it was named Harris for them. It was given a post office named Harrisville on September 16, 1857, with Levi O. Harris as it s first postmaster. The Harris brothers sold out to West, Colwell & Company, and they founded the village in 1866. They had it platted by H. G. Rothwell in 1870. Incorporated as a village in 1887 and as a city in 1905. Photo courtesy of Enchanted Forest Web Page Design Service. 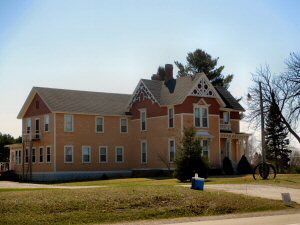 Bailey Log School [Historic Building], Alcona Historical Society, P.O. Box 174, Harrisville, MI 48740, Phone: (989) 724-6297. Sturgeon Point Light Station, P.O Box 174, Harrisville, MI 48740. Phone: (989) 724-6297. The Sturgeon Point Light Station is a lighthouse on Lake Huron in Alcona County, northeastern lower Michigan. Established to ward mariners off of a reef that extends 1.5 miles lakeward from Sturgeon Point, it is today regarded as a historic example of a Great Lakes lighthouse. The light station was built in 1869 of brick masonry on a limestone foundation. The tower stands 70 feet 9 inches in height, with a diameter of 16 feet at the base. The adjoining, two-story keeper’s quarters was designed in the Cape Cod style and built of the same materials. The light began its service with a sixth-order Fresnel lens which was upgraded to a 3.5-order lens (which had been originally installed at Oswego, New York twenty years later. In 1876, the light station was joined in its service by an adjacent United States Life-Saving Service station.] By the 1940s, the light was fully automated, and the Coast Guard withdrew all personnel and dismantled the life-saving station. The light station is a registered National Historical Landmark. Ownership was transferred from the Coast Guard to the Michigan Department of Natural Resources under the terms of the National Historic Lighthouse Preservation Act, and operations are maintained by the Alcona County Historical Society. The lighthouse is maintained and operated by the Alcona Historical Society, which is a private organization that funds the maintenance and operation with few public funds. The Society is in the process of raising contributions to renovate and paint the lighthouse. The tower is regularly open during the summer for climbing by the public (for a small fee to cover insurance costs). The museum is open to the public, and is supported by donations. 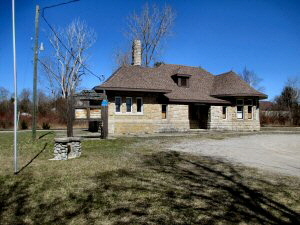 Sturgeon Point Lighthouse & Museum, Alcona Historical Society, P.O. Box 174, Harrisville, MI 48740, Phone: (989) 724-6297. 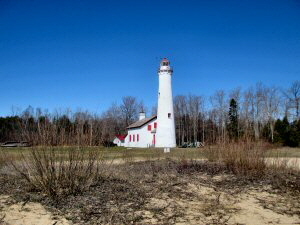 Sturgeon Point Lighthouse is located five miles north of Harrisville on Lake Huron and was completed in November 1875. The tower is 70 feet, 9 inches tall and is 16 feet in diameter at its base. The light is 3.5 order Fresnel lens made in Paris, France. The light is still maintained by the U.S. Coast Guard. The keeper's house is now a maritime museum which is open to the public seven days a week from Memorial Day to mid-September. The lighthouse tower is not open to the public. The grounds are open all year. Harrisville State Park [Campgrounds & RV Parks], 248 State Park Rd., Harrisville, MI 48740. Approximate Size: 107 (Acres). Phone Number: (989) 724-5126. Harrisville State Park features a campground and day-use area nestled in a stand of pine and cedar trees along the sandy shores of Lake Huron. 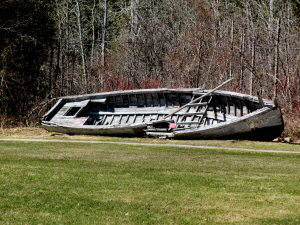 The park is within walking distance of the resort town of Harrisville and it's many events and close to Sturgeon Point Lighthouse. 195 campsites.